Shortly after I got my snazzy immersion blender I came across a recipe for veggie-packed spaghetti sauce. It was made in the crock pot, which sounded awesome, but as someone who doesn’t like crazy chunky sauce I wasn’t super psyched about the amount of diced vegetables packed into it, mainly for textural reasons. Immersion blender to the rescue! I tweaked the recipe to use vegetables I actually like (not a fan of mushrooms or eggplant, sorry) and made it on the stove so I could puree some of it before adding the things I wanted to stay whole. You can easily add or remove items to suit your preferences, next time I will definitely add sliced olives. M has such a strong hatred of them I forget I can add them when he’s not around. I think a couple handfuls of spinach added to the pureed mixture would be great also. With veggies secretly packed into what a appears to be a normal spaghetti sauce, this is a great way to trick your kids (or yourself) into eating some extras at dinner time. I will perhaps use a slightly smaller head of cauliflower in the future (mine was more medium than small) but overall it turned out fantastic. Tomatoes and spices galore, with some diced red bell peppers for variety. If you leave the sauce meatless it’s a great vegan option, but if you’re of a more carnivorous persuasion, read on. Because I was feeling particularly ambitious that weekend, I also made Italian meatballs. Extra juicy and perfectly spiced, they were wonderful with ground elk but I’m sure ground beef would be delicious also. This was a super easy recipe that would pair well with any sauce, even a jarred version, just make sure they have time to simmer in the sauce for about 15 minutes to ensure they are cooked through. Or if you are making them to freeze, turn the heat down on your frying pan, add a lid, and steam them for several minutes. For an easier meat option, skip the meatballs and add a pound or two (it makes a lot of sauce) of your favorite ground meat, already browned, during the final simmering step. You should have enough to feed the whole family and probably still put some in the freeze for later. While pureeing it can be quite thick so have patience during this step; other than that it’s just a matter of chopping vegetables and opening some cans – super easy. Make a batch for dinner, put half in the freezer, and you’ll have homemade sauce ready to go on a day you don’t feel much like cooking. 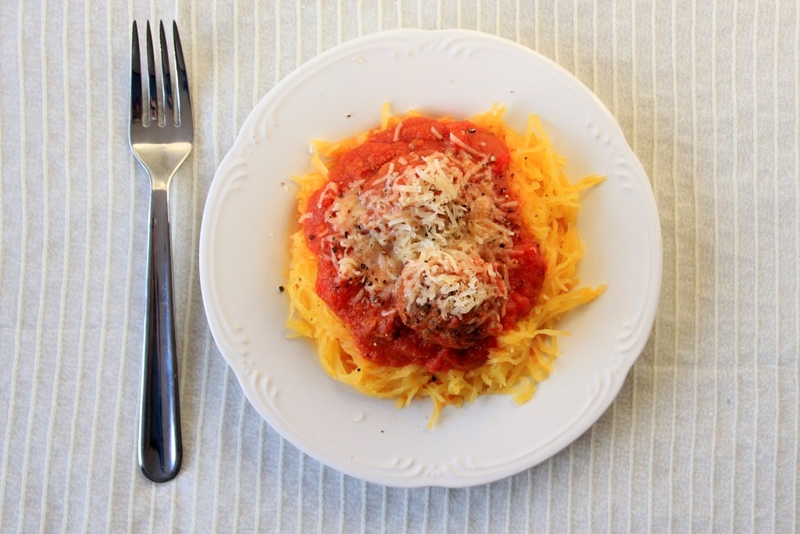 Serve with roasted spaghetti squash (directions below) or your favorite pasta, with freshly grated Parmesan and pepper, for a delicious and healthy meal. Pour oil into a large pot (8 quarts or more) and heat over medium heat until hot. Add onion, cauliflower, zucchini, and garlic, and saute until onion is softened and translucent. Add tomato sauce, tomato paste, and stewed tomatoes. Increase heat slightly, and simmer until vegetables are softened. Optional but recommended: puree sauce using an immersion blender until reasonably smooth. Add diced tomatoes, bell pepper, spices, (and browned meat or meatballs, if using) and simmer on low heat for about 15 minutes. Do a taste test after about 5 minutes, and add more spices if necessary. I added around 3 tablespoons of seasoning but depending on your veggies and your taste preferences, more or less might be appropriate. 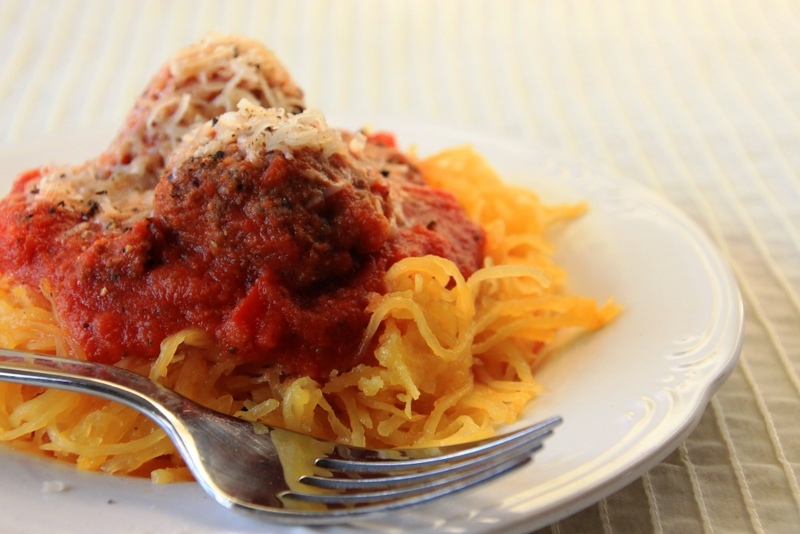 Serve with your favorite pasta or spaghetti squash. Tear bread into small pieces and place in a large bowl. Add onion and stir until well mixed and bread is completely wet. Add remaining ingredients and mix by hand until completely combined. Scoop 2 tablespoons at a time on to a plate or cutting board, then roll each dollop into a ball. Heat olive oil in a large non-stick frying pan over medium heat. Gently add meatballs and fry, turning gently, until nicely browned on all sides (pro tip: this is easier in two batches). Add meatballs (and drippings, if desired) to your spaghetti sauce and simmer gently for about 15 minutes, until meatballs are heated through. 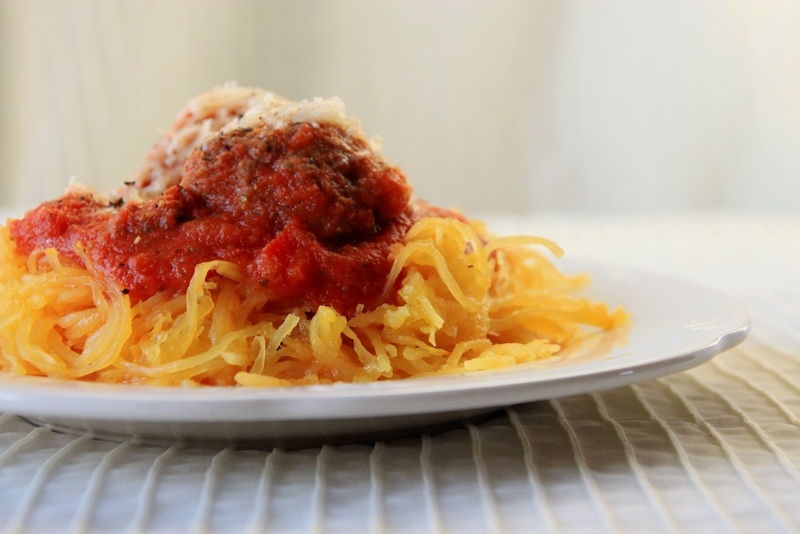 Serve with sauce atop your favorite pasta or spaghetti squash, with extra freshly grated pepper and Parmesan. Halve squash and remove seeds. Coat flesh lightly with olive oil. Bake for about 40 minutes, or until squash can be easily pierced with a fork. Let cool for a few minutes, then scoop from skins, fluff with a fork, and serve hot. Top with additional olive oil, butter, or your favorite pasta sauce.